Sun and clouds mixed. High 81F. Winds WSW at 10 to 15 mph..
Nikki Kulcsar reaches for a high volley in the district tournament at Charlotte High School on Tuesday morning. Venice girls No. 1 singles player Jia Johnson returns the serve of Charlotte’s Sofia Scalvini during the 3A-11 District Tournament at Charlotte High School on Tuesday. Ryan Rajakar returns a hard serve in the opening day of the district tournament at Charlotte High School. Venice boys No. 1 player, Ben Zipay, had no issues winning his opening two matches on Tuesday. When the District 3A-11 tennis tournament gets back under way this morning at Charlotte High School, it will have the look and feel of a regular season match between Venice and Fort Myers high schools. That’s because both schools won all its matches, both boys and girls, to advance to the finals in singles and to the semi-finals in doubles. Venice had the top seed in 11 of the 14 brackets, meaning it got an opening round bye. This helped the Indians, as they usually played someone who had already played early in the morning. Fort Myers had the top seeds in the No. 1 matches, with Shani Idlette and Tyler Carlin winning with “double bagels,” and in No. 2 boys. 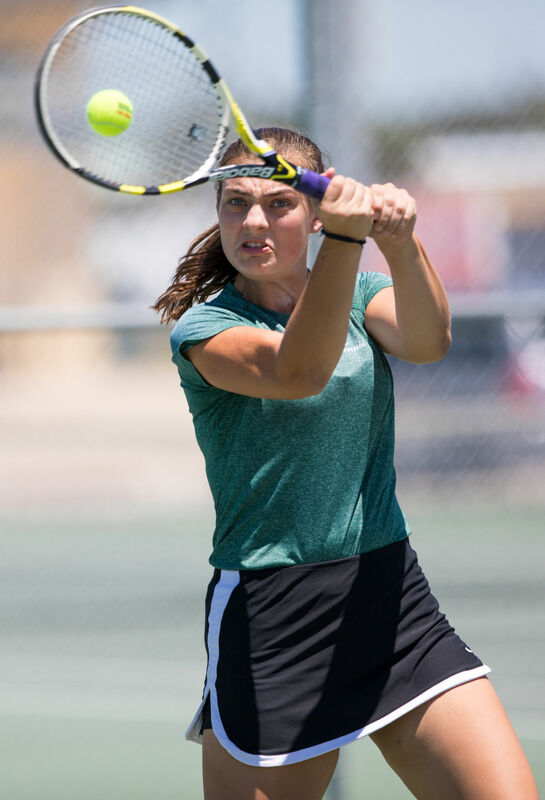 Venice had no trouble in the remaining singles matches (and didn’t have to play doubles with the bye), As Nicolette Kulcsar, her sister Laura, Katelyn Houston and Alexa Moghina all won. Jaden Weisinger, Alessandro Dina, and Ryan Sherwood won for the Venice boys. For the other local teams, things didn’t go nearly as well. Trey Flores was the only winner for the Charlotte boys, who won his first round No. 1 match for Charlotte before being eliminated by Carlin. The girls had slightly better news. Sofia Scalvini won her No. 1 match over Miranda Persaud of Riverdale as well as No. 1 doubles with Elizabeth Davis. Davis also won her first-round match over Riverdale’s Amy Piper 6-1, 7-5, as did No. 5 Paige Kehoe, who rallied from a set down to beat Ida Baker’s Christina Casiano 4-6, 6-3 10-7. Both were beaten soundly in the semi-finals. For Port Charlotte, Megan Corn won her No. 3 match against Mary Jo Ellis of Ida Baker 6-3, 3-6, 10-4, while the No. 1 doubles team of Michelle Bifaretti and Sarah Sutter rallied from a set down to beat Emma Westgate and Ashley Donnell of North Fort Myers 4-6, 7-5 10-8. For the boys, Jonah Katz defeated Remy Vo of Ida Baker 6-1, 6-1 in a No. 3 match, while Marc Johnson rallied to beat Jacob Chouinard of North Fort Myers 4-6, 6-2, 11-9 in singles No. 4. That both Venice and Fort Myers will advance both their programs to regionals is a foregone conclusion. Now, it’s just a matter of who plays better today.